Extracts from my Facebook page. These tell the whole sorry tale behind the original painting that ultimately led to the final painting displayed at the bottom of this post. It’s long, but I hope if you can persevere till the end you might enjoy it. For the last few days I’ve been scouring wetlands near and far in search of Spoonbills. I’ve nearly finished a painting of Ibises and felt a Spoonbill painting would be a suitable follow-up. But they seem to be very hard to find lately (and as you may know, I refuse to simply copy somebody else’s photos off the internet – I have to actually find the birds myself). A visit to Bibra Lake the day before yesterday yielded not even a single Spoonbill, but instead there were lots of swallows flying around chasing insects. Consequently I have now also nearly finished a swallow painting which, so far, looks like it might end up okay. I think next weekend you could expect to see either an Ibis painting or a Swallow painting ….. but wait ….. this morning at Herdsman Lake ….. could it be?….. yes, I finally found my Spoonbill! So, who knows? 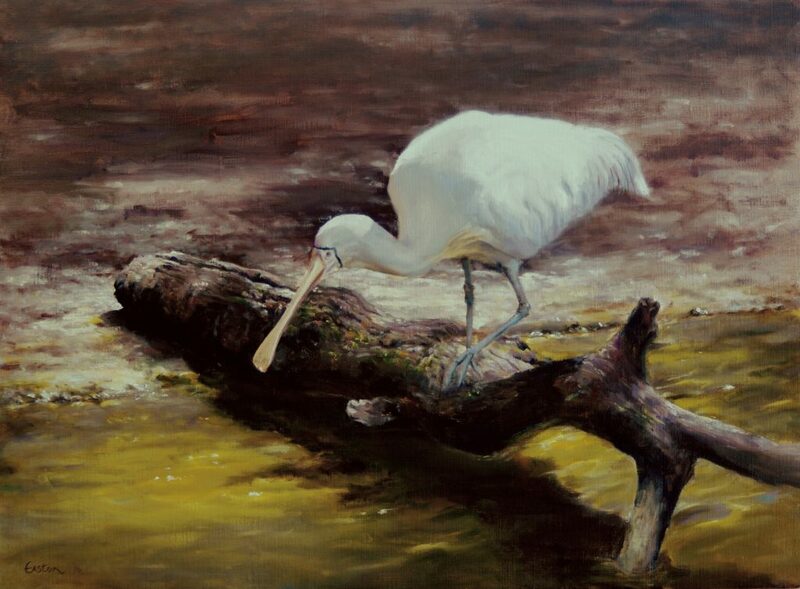 Next weekend’s painting might even be a Spoonbill. I’ve started the Spoonbill painting but he’s still got a fair way to go before he’s done. (some other miscellaneous ramblings) … I even found another spoonbill while I was there. After so much searching in vain – then finding two in different places in quick succession. Speaking of which, the spoonbill painting is being a little troublesome I’m afraid. Well not necessarily so much the spoonbill itself but mainly the rest of the picture – reeds and grasses and stuff – and how much detail and colour etc to put in. I got to the stage of getting out a brand new canvas and preparing to start the whole thing all over again when I decided to listen to my own advice. I tell people when things aren’t going right “Don’t worry, it’s oils, you can fix anything”. So I’ve put the new canvas away again and am pressing on with the original painting. The bird is now looking rather good and I’m starting to get a clearer idea of how to do the rest of the painting. So ….. maybe next weekend? 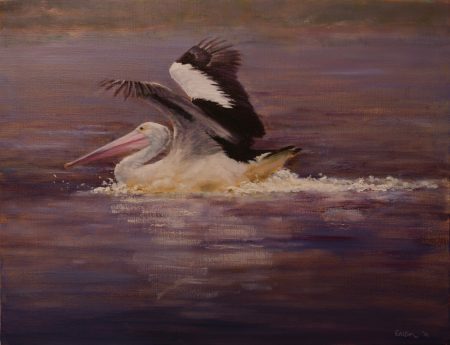 I’ve got lots of excuses ….. been busy with some other work … been doing some other paintings … the dog ate my homework ….. but in the end the truth is that the much-talked-about spoonbill painting is still not finished. But if I keep putting it off you’ll start to think that I’ve been making the whole thing up and that such a painting doesn’t even exist. Well here’s the evidence, for good or bad. It’s still giving me a lot of heartache and it’s been quite a struggle to get it even this far. I wanted the picture to be just about the bird and it’s immediate effect on the water, with only a vague indication of the surrounding wetlands. Well I guess you could say I got what I asked for. But I’m not happy with what I got so I’m going to have to keep on at it and hope for a miracle! Reader’s Comment: No miracle needed, looks great to these mere mortals. My reply: Remember “Don’t worry, it’s oils – you can fix anything”? Well I’ve “fixed” the background about three times now. It bears no resemblance to how it started out. I think the current concept might be okay, just need to execute it better … but if I can get a miracle it would save me some time. … with the fate of his troublesome “Spoonbill” painting now consigned, so he thought, to the beneficence of the appropriate deity, the hopeful artist sat back and waited. He had never before requested a miracle as a means of getting a painting finished and felt a great sense of calm and relief as though he had just shrugged a heavy burden from his shoulders. “This must surely become the greatest painting I have ever done” he imagined. In anticipatory celebration he went out and purchased two bottles of the best wine he could afford from the bargain bin (to his unsophisticated palate “best” meant “highest alcohol content per dollar”). The first two glasses, forced down as fast as he could manage through puckered lips, made the third a little easier to swallow, and the fourth almost drinkable. The second bottle slipped down virtually unnoticed. Rubbing his eyes and looking around in blurry confusion, unable to understand how it was now three hours later than it had been just a few minutes ago, he wondered whether, maybe, this was the way miracles worked. So he sleepily stumbled to his studio in naïve expectation of finding there his miraculously completed “Spoonbill” … or, what would be even better, to perhaps witness the miracle still in action! …..
….. Undeterred by what seemed to be a lack of results he considered whether he may be appearing too impatient. After all, there are thousands of artists in the world and probably most of them also seeking similar miracles. Maybe he just needs to wait his turn. “Best, while waiting, to be seen to be a hardworking and deserving recipient” he told himself, in the absence of anybody else to talk to. 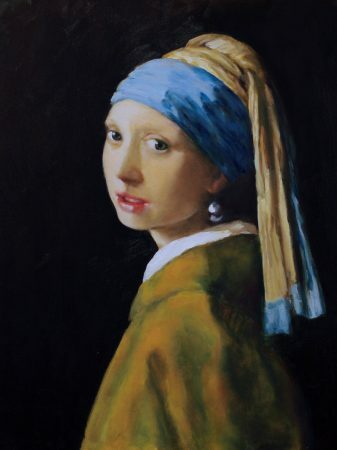 “I shall set about reproducing one of the most famous masterpieces of all time – none other than Vermeer’s ‘Girl with a Pearl Earring’. Undoubtedly that will do it”. He laboured long and painstakingly through a rollercoaster of emotions, from the depths of despair to the heights of slightly less despair, and finally one day stepped back from the easel and surveyed the finished work. “Hmmm, not too bad – could be a bit better” he allowed himself. High praise indeed! Now if he, a mere human, had been able to recreate a great work of art, there could be no reason why, in that time, a higher being couldn’t have pulled off a minor miracle with a few bits of grass and reeds. I saw an exhibition recently which had me wondering about that very question. One of the pieces was nothing more than a large sheet of plywood which had pretty obviously just been picked up from a building site, hung on the wall, given a rather silly esoteric title and a very silly price tag and apparently was thus now a work of art. It appears that the answer to the question is that contemporary art can be anything at all as long as it is non-functional, has a title and a price (the higher the better). And the title should be such that the viewer thinks there must be something deep and meaningful about it. I’m afraid I must still be a bit old-fashioned because today’s picture has actually been painted, using oil paints, on linen, and bears some resemblance to the real life subject. It is a pelican. Sort of a companion painting to the previous pelican from a few weeks ago. ….. Hmmm ….. I wonder ….. I know what to do! ….. I could say I’m challenging our ingrained beliefs and our notions of accepted reality and call it, instead of a pelican ….. a spoonbill …!! Then I could put a massive price on it. 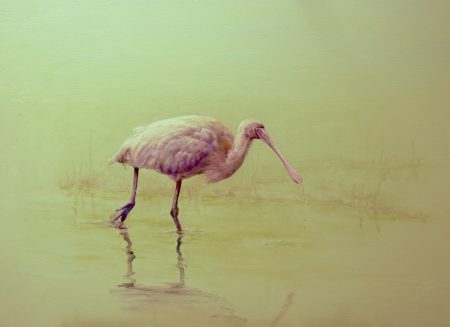 And better still, I would now be able to say my Spoonbill painting is finished. Maybe this was the miracle I was waiting for??? … All hopes of a saving miracle long since dashed, he savagely kicked the easel and threw his brush down in disgust. Then, grabbing the painting in a fit of rage, brandished it above his head and looked around for some sharp object to impale it on. Ideally something black and evil-looking with lots of jagged, pointy bits, to inflict the maximum damage. All such objects having been already removed some time ago for his own safety, he was at a loss as to what to do now. So he gave the painting a severe and prolonged shaking and hurled a string of vitriolic abuse at it. Exhausted, he lowered the painting and let it fall to the floor. Of course it landed face down. Of course it was still wet.